As healthcare costs grow, physicians need to fully understand the costs and benefits of the care they provide, including imaging and radiation therapy. An interesting article in a prominent cancer journal addresses the topic. The cost of oncology treatments and procedures have escalated along with their technological innovation. Given the costs, oncology physicians should fully understand the economic impact of new and expensive interventions. That’s the message in a recent report from the American Cancer Society (ACS). Such thorough comprehension is best accomplished via methodical economic evaluation that compares costs and outcomes between the new and the more traditional interventions, according to the report’s authors, Michael T. Halpern, MD, PhD, and Ya-Chen Tina Shih, PhD. “Economic Evaluations of Medical Care Interventions for Cancer Patients: How, Why, and What Does it Mean?” represents four months of research and data interpretation and was published in the July/August issue of CA: A Cancer Journal for Clinicians. The authors’ basic premise is by no means revolutionary. As Halpern and Shih indicate, economic evaluation—specifically one that considers relative costs vs. benefits of new and expensive interventions—has been deployed in various medical areas for more than 20 years. However, only recently have the concepts been applied to oncology. One major cause for the delay is a cost-be-damned viewpoint: As cancer has devastating physical and emotional consequences, many in the cancer care community feel that anything that potentially increases patient survival and enhances quality of life is fully justified, no matter how steep the financial price. It’s difficult to argue against that reasoning, but Halpern and Shih report that economic considerations need to be factored into the clinical equation. Healthcare budget constraints make it necessary for oncology clinicians to apprise themselves of cost-vs.-benefit considerations related to recent advancements in diagnosis and treatment. 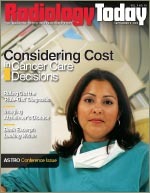 • MRI screening for breast cancer costs runs as high as $1,000 per image, or 10 times the cost of screening mammography. • The price for a PET scan for cancer staging runs as high as $1,800. • The costs of intensity-modulated radiation therapy (IMRT) to treat prostate cancer equals $48,000 per patient each year. Commenting on the paper’s message, David C. Beyer, MD, vice president of Arizona Oncology Services Inc, says it poses a challenge to the oncology community. “It addresses issues that, in my opinion, demand a great deal more attention,” says Beyer, who is also a member of the board of directors for the American Society of Therapeutic Radiology and Oncology and the board of chancellors for the American College of Radiation Oncology. At the same time, Beyer understands why the message has been a long time coming. “The subject can be simply uninteresting or overwhelming for people who are more focused on patient care than costs and health policy, even though many new therapies and techniques have been introduced without the benefit of rigorous cost-benefit analysis,” he says. As such, the paper provides solid informational background for clinicians not involved in health policy on a daily basis. “For the benefit of the medical community and patients’ best interests, as well as the greater society, I think we need to pay greater attention to economics,” says Beyer. One of Halpern and Shih’s aims was to indicate why oncology clinicians should care about cost and cost-effectiveness, especially as it relates to clinical practice. Their answer includes more than one salient point. For one, they note how most insurance plans increasingly require patients to foot the bill for a significant portion of the medical care they receive. “That portion comes directly out of pocket,” Halpern says. Individuals without insurance or with only minimal coverage face even higher personal costs. Many patients falling within these parameters can’t afford the optimal treatments their physicians recommend. Also, they believe physicians should care about the topic because, with insufficient resources to satisfy everyone, recommended medical treatments must represent reasonable uses of available resources, given the value society puts on the associated outcomes. • Study perspective and comparators: A well-designed health economic evaluation must clearly state the study perspective and the competing interventions to be explored, the authors explain. • Direct and indirect costs: Direct costs quantify the medical (and nonmedical) resources used in direct relation to the medical interventions. Indirect costs relate to less tangible elements such as productivity loss and quantify the time consumed or saved by patients and their caregivers as a result of the interventions. • Time: Time effects are integrated into the evaluation by discounting and inflation. “For studies evaluating costs of a period longer than one year, such as those that follow patients from treatment initiation to death, future costs and outcomes must be ‘discounted,’” the authors wrote, adding that time also factors into economic evaluation for inflation adjustment when calculating the cost of care. • Cost analysis: This deals only with the cost component of competing interventions, regardless of potential differences in clinical outcomes. • Cost-minimization analysis: This economic evaluation method helps calculate the least expensive alternative when all considered interventions have equivalent clinical outcomes. • Cost-benefit analysis: Doing a cost-benefit analysis quantifies both costs and outcomes of competing healthcare interventions in monetary units. • Cost-effectiveness analysis (CEA): Unlike a cost-benefit analysis, this metric expresses consequences (such as effectiveness, benefits, and outcomes) in a nonmonetary evaluation appropriate for describing an intervention’s desired objectives. These can include survival, progression-free survival, and the rate of complete response or number of adverse events avoided during cancer therapy. • Cost-utility analysis (CUA): An extension of a CEA, a CUA uses an effectiveness measure (quality-adjusted life year) to address CEA limitations. Halpern and Shih’s report primarily employs examples related to chemotherapeutic treatments. So can one be forgiven for asking whether it is directly applicable to imaging and radiation therapy? Moreover, he says that even though the authors’ review takes in a very broad picture, the work is important insofar as the imaging community hasn’t undergone the same kind of surveillance that is depicted. “From an economic perspective, surveillance hasn’t been as extensive as seen in the therapeutic community,” says Divgi.